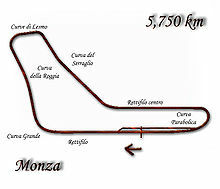 The 1958 Italian Grand Prix was a Formula One motor race held at Monza on 7 September 1958. It was race 10 of 11 in the 1958 World Championship of Drivers and race 9 of 10 in the 1958 International Cup for Formula One Manufacturers. Vanwall won the Constructors' Championship with 1 race left to go. Notes: Only the top five positions are included for both sets of standings. Only the best 6 results counted towards each Championship. Numbers without parentheses are Championship points; numbers in parentheses are total points scored. ^ Lang, Mike (1981). Grand Prix! Vol 1. Haynes Publishing Group. p. 138. ISBN 0-85429-276-4. ^ "1958 Italian Grand Prix". formula1.com. Archived from the original on 3 June 2014. Retrieved 16 August 2015. ^ a b "Italy 1958 - Championship • STATS F1". www.statsf1.com. Retrieved 1 March 2019.